The iPod photo was a great idea, but it had one major flaw: unlike other media storage devices, there was no way to directly import images from your camera or media card. With Apple's £19 iPod Camera Connector, this shortcoming has been addressed - although not in a terribly elegant or efficient way if you prefer to shoot your digital images in RAW mode. At the time of going to press, Apple listed 83 cameras compatible with this at www. apple.com/ipod/compatibility/ cameraconnector.html. Moving your images from one of them to your iPod photo is simplicity itself. 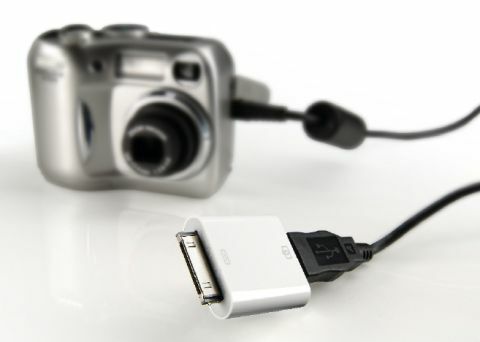 Just insert one end of the Camera Connector into your iPod's docking slot, then connect your camera's USB cable into the USB slot on the other end of the Camera Connector. A couple of seconds later, your iPod will display the number of photos in your camera and the total size of the import. All you have to do is select Import, click your iPod's central selection button, and sit back while import begins. When the import process is finally complete you'll be offered two choices: Done or Erase Card. Choose Done, and a list of what you've just imported will roll alongside other imported rolls. Select a roll, and you're given the option to Browse that roll or Delete it. Unfortunately, you can only delete an entire roll, not individual images - annoying. Select Browse, and you're presented with the iPod photo's five-by-five microthumbnail image-selection screen, where you can select an image for viewing or start a slideshow using the settings you've defined in Photos > Slideshow Settings, including your choice of backing music. If you've shot your images in RAW-only mode, the microthumbnails show up as circles with the word 'RAW' inside. Select one of them for viewing and an error message pops up: "This photo format cannot be viewed on iPod". It then instructs you to connect your iPod to your computer and synchronise it with iTunes. Here's where things start to get a bit less intuitive. When you dock your iPod and open iPhoto, you're presented with a pane that displays an image of an iPod photo and Ready To Import Items. If you've shot in RAWplus- JPEG mode on your camera, that number is double your actual exposures. Click the Import button, and the images are displayed during import. iPhoto then displays the Library with the uploaded photos appended; RAW photos are given a keyword of 'Raw'. If you now check in your Mac's user name/Pictures/iPhoto Library, you'll find a dated folder containing the JPEGs you imported; your NEFs are in a nested Originals folder. However, iPhoto not only keeps the JPEGs of the RAW-plus-JPEG pairing, it also creates JPEG duplicates of the RAWs and keeps them with the original JPEGs - each image appears twice in the iPhoto Library. Confused? So were we! To get the images into your iPod photo's Photo Library, launch iTunes and dock your iPod photo; iTunes will update it with the images you imported into iPhoto. If you shot in RAWplus- JPEG mode, the original JPEGs and those made from NEFs appear in the iPod photo's Photo Library; originals in Photo Import > Roll are untouched and must be deleted manually.